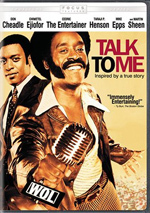 Academy Award nominee Don Cheadle portrays the one and only Ralph Waldo "Petey" Greene, Jr. in this funny, feel-good and inspiring true story. Ex-convict Greene talks his way into an on-air radio gig with program director Dewey Hughes (Chiwetel Ejiofor), and his unprecedented "tell it like it is" style breaks all the rules while electrifying a city and bringing a nation together when it needs it the most. Also starring Cedric The Entertainer, Taraji P. Henson, Mike Epps and Martin Sheen, Talk to Me tells the extraordinary story of an outrageous and beloved voice ready to shake up the world in the movie critics are hailing as "fresh and revelatory" (Carina Chocano, Los Angeles Times). $402.000 thousand on 33 screens. With 2007’s Talk to Me, we check out the scene in Washington DC circa the mid-1960s. We open in May 1966 and meet radio producer Dewey Hughes (Chiwetel Ojiofor). When he visits his incarcerated brother Milo (Mike Epps), we learn of prison DJ Ralph Waldo “Petey” Greene (Don Cheadle). The talkative inmate tries to wheedle a job out of Dewey, but with Petey in the stir for another five to 10, it doesn’t look like this’ll be an issue any time soon. Dewey’s station isn’t doing well, so his boss (Martin Sheen) gives him the assignment to bring the ratings up to snuff. Before too long, Petey does the warden (Peter MacNeill) a big favor – enough of one to get out of the joint. Back on the street, Petey heads straight to Dewey’s station to claim “his job”. When Dewey rebuffs this demand, Petey puts pressure on him and eventually gets his DJ gig. Petey’s first morning on the air goes poorly. He loses his job and Dewey gets demoted. However, Dewey still thinks Petey can deliver the goods, so he stages a coup to put his man back on the radio. This causes a ruckus but works. 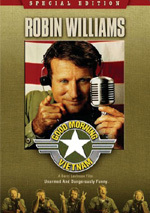 Petey becomes a major hit in DC, and the rest of the movie follows him and Dewey as they rise to the top – and have to deal with various issues along the way. First-time director Kasi Lemmons does a more than competent job with Talk. Best known for her role as Clarice’s friend in The Silence of the Lambs, she shows a pretty self-assured hand behind the camera. No, she doesn’t create a flawless flick – more about that later – but she manages to handle the movie’s ups and downs well. Case in point: the sequence in which we learn that Martin Luther King has been shot. Up until this announcement, the movie embraces a moment of broad comedy via a fight between Petey and fellow DJ the Nighthawk (Cedric the Entertainer). The film’s tone shifts on a dime from this goofy piece of semi-slapstick to get super serious in the wake of the tragic news. Many directors would make the shift awkwardly, but Lemmons manages to go from comedy to drama in a smooth, believable manner. It’s a great moment in the movie and one that shows real talent behind the camera. Of course, Talk boasts a lot of talent in front of the camera as well. Cheadle is one of those actors who apparently never gives us a bad performance. He’s as steady as they come, and that holds true for his work as Petey. This isn’t a character who requires Cheadle to break a sweat, but the actor still fleshes out the role well. While the movie usually embraces Petey’s brash, comedic side, it allows of other tones as well, and Cheadle handles them all with aplomb. Indeed, he probably makes the role more natural and three-dimensional than the script set him up to be. Therein lies some of the problems with Talk. For one, the script feels underwritten in areas and overdone in others. It telegraphs bits that needed to come to us in a more understated manner, and it leaves other elements out of the mix entirely. The screenplay does what it needs to do, but it lacks the polish that could’ve made the movie more consistently involving. At no point does Talk ever threaten to be anything other than a pretty conventional biopic. You’ll find few surprises along the way as we watch the careers of Petey and Dewey, and you’ll see no reinvented wheels for sure. That’s not a bad thing, per se, but I do wish the movie would’ve taken a few more chances and not been such standard fare, especially during the hurried and uninvolving second half. That said, I find more in Talk to Me to like than to dislike. The flick boasts little real spark, but it shows a solid hand behind it and it usually remains entertaining. Don’t expect anything remarkable and you’ll get a good time here. Talk to Me appears in an aspect ratio of approximately 2.35:1 on this single-sided, double-layered DVD; the image has been enhanced for 16X9 televisions. While watchable, the transfer seemed somewhat lackluster. Some of the concerns related to sharpness. The movie fluctuated between nicely detailed shots and others that looked moderately soft. The former dominated but we got enough of the latter to create some distractions. Jagged edges and shimmering caused no concerns, but I noticed a bit of edge enhancement. At least source flaws remained absent in this clean presentation. Talk presented a limited palette much of the time that featured largely stylized colors. Within those constraints, the tones looked erratic. Some colors appeared lively and concise, but others were mushy and flat. Blacks tended to be a bit drab and inky, while shadows were often somewhat dense and impenetrable. The image improved as the film progressed, so I felt comfortable with a “C+” for the visuals, but I still thought the overall package was less than impressive. As for the Dolby Digital 5.1 soundtrack of Talk to Me, it seemed satisfying but unremarkable. Audio quality was usually fine. I noticed a little edginess to some lines, but speech mostly came across as distinct and concise. I discerned no problems with intelligibility. Music was bright and full, while effects showed good definition. The rare instances of louder elements like during the 1968 riots displayed nice oomph to the effects. The soundfield stayed generally subdued. Music offered positive stereo spread, while the track created a fairly good sense of place. Again, only a few scenes really brought the track to life, with the 1968 riots acting as the most prominent example. Indeed, I’d be hard-pressed to think of another part of the movie that used the surrounds in a truly noticeable manner. Not that a chatty flick like this needed a slam-bang mix. The audio seemed fine for the material. Only a few extras fill out this set. We get two featurettes. Who Is Petey Greene? runs 10 minutes, 13 seconds and mixes shots from the set, movie clips and comments from producer Josh McLaughlin, director Kasi Lemmons, executive producer J. Miles Dale, and actors Taraji P. Henson, Mike Epps, Cedric the Entertainer, Martin Sheen, Vondie Curtis-Hall, Chiwetel Ejiofor, and Don Cheadle. We get some minor biographical notes about Petey and Dewey, but mostly we hear praise for the real-life personalities. The featurette doesn’t tell us much we don’t know from the movie and feels more promotional than anything else. Next we get the 11-minute and seven-second Recreating P-Town. It features McLaughlin, Cheadle, Lemmons, Henson, Ejiofor, Dale, costume designer Gersha Phillips and production designer Warren Alan Young. This one focuses on costumes, visual design, sets and recreating historical elements. It doesn’t dig into the subjects with great depth, but it works fairly well. We get decent info on the period challenges of flick in this reasonably entertaining show. Six Deleted Scenes fill a total of eight minutes, 33 seconds. These include “We’re Not the Celtics”, “Sonderling After the Riot”, “What Were You Thinking?”, “Dress Rehearsal”, “Six Months” and “Walt Whitman High School”. “Celtics” is a funny gag about the negative fortunes of the station, while “Riot” offers a minor extension to the existing scene. “Thinking” follows up one of Petey’s controversial statements, and “Rehearsal” shows us what Petey’s Tonight Show act would’ve been. Finally, “Months” shows Petey’s attempts to get back with Vernell, and “Whitman” shows Petey’s graduation speech at a local school. “Celtics” and “Rehearsal” are probably my favorites, and they might’ve been good in the final flick. The others seem less crucial. A few ads open the DVD. We get promos for Reservation Road, Focus Features, HD-DVD and Balls of Fury. No trailer for Talk appears here. An enjoyable but insubstantial biopic, Talk to Me manages to entertain. Though it fares better in its first hour than its second, it’s still an interesting enough flick to keep us with it until the end. The DVD presents pretty average picture and audio plus some minor extras. This release seems pretty mediocre, but I like the movie enough to recommend it for a rental.